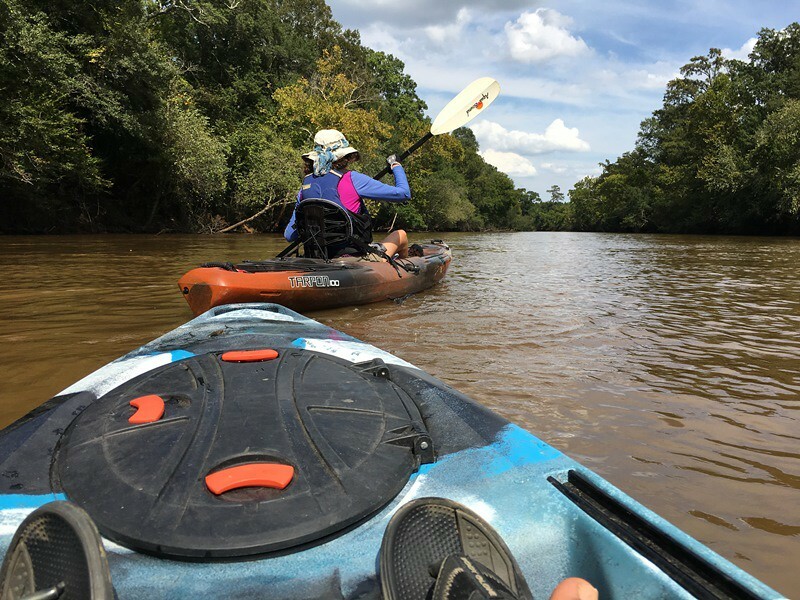 An alternative way to complete the MST through North Carolina’s coastal plain is to paddle the Neuse River for 170 miles from Smithfield to the northern end of the Neusiok Trail in the Croatan National Forest near Havelock. The Neuse River runs 227 miles from Falls Lake to Pamlico Sound. Marking the Falls Lake dam as River Mile 0, the MST portion runs from River Mile 45.8 to 215.8. These river miles correspond to Eastbound (EB) Mile 51.3/Westbound (WB) Mile 13.5 in Segment 11 and EB Mile 46.5/WB Mile 21.3 in Segment 16 of the MST hiking route. Beginning as a fast-moving, narrow river, the Neuse gradually widens and slows, occasionally splitting into multiple channels. By the time it reaches Pine Cliff Recreation Area, where the MST paddle route ends, it has formed a 2.5-mile-wide estuary. The river flows on another eleven miles to empty into Pamlico Sound, where it spreads to five miles wide. Throughout your paddle the shores are heavily forested, often with a wilderness feel. In places, the banks fall away at water level; in other places—notably Cliffs of the Neuse State Park,–they can range as high as 90 feet above the river. Around every bend you will find new wonders: cypress swamps; sand banks and bars for camping; birds of every description (heron, kingfisher, osprey, warblers); and wildlife coming down to drink from the river. The few towns along the river present welcome opportunities to get a meal, explore eastern North Carolina’s history, camp, or just take a break. 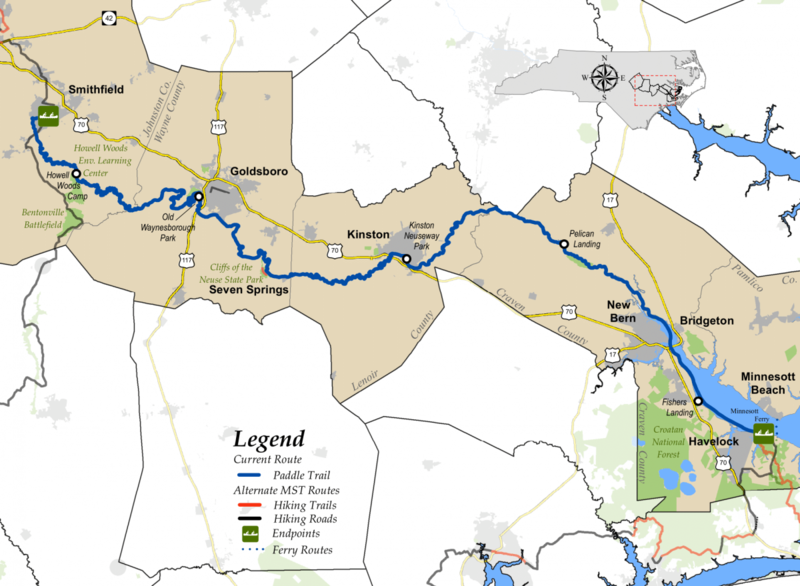 In Goldsboro, Kinston, and New Bern (as well as in Cliffs of the Neuse State Park), you will find walking trails that State Parks has accepted for inclusion in a planned continuous MST hiking route paralleling the Neuse. For an advanced look, take a virtual trip down the river using Google Earth or Mapquest Satellite. In addition, we highly recommend using a good GPS device for navigation on the river. This guide provides coordinates to help locate nearly every feature on the river, many of which can be difficult to find from a boat. 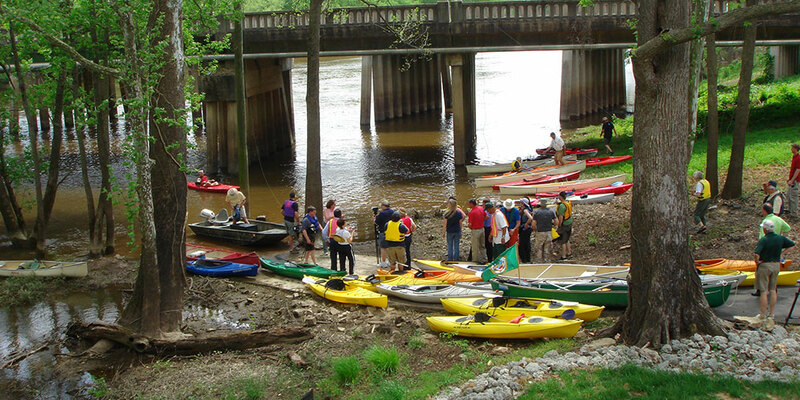 People interested in paddling the entire river should contact Sound Rivers for further information.